David Smith with Australia, Bolton Landing, New York, ca. 1951. Photo by David Smith, ©2006 The Estate of David Smith/Licensed by VAGA, New York. David Smith, Cubi I, 1963. Stainless steel, 124 x 34 1/2 x 33 1/2 inches, Detroit Institute of Arts, Founders Society Purchase, Special Purchase Fund, Photograph by David Smith, © The Estate of David Smith/Licensed by VAGA, New York. Widely considered the greatest sculptor of his generation, David Smith (1906–1965) created some of the most iconic works of the 20th century. 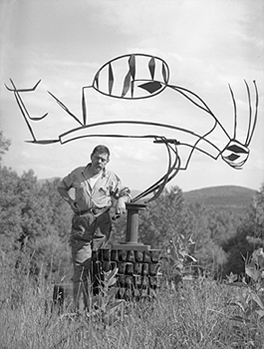 Marked by the use of industrial materials, especially welded metals, and the integration of open space, Smith’s three-dimensional version of Abstract Expressionism revolutionized the art of sculpture in the U.S. and around the world. Organized on the 100th anniversary of the artist’s birth, David Smith: A Centennial presents over 120 of his greatest sculptures, as well as a selection of his drawings and sketchbooks, from his entire 33-year career as a sculptor. Considering his art as a totality, the exhibition provides audiences with a singular opportunity to understand the complexity of Smith’s aesthetic concerns as well as his impact on the course of modern and contemporary sculpture.In addition to bringing together the masterpieces of Smith’s mature period in the 1950s and 60s, the exhibition gives special emphasis to his connection with his European forebears. In his early works, Smith introduced into the idioms of American sculpture the models pioneered during the 1920s by Pablo Picasso, Julio González, Alberto Giacometti and the Russian Constructivists. Most importantly Smith took up the Cubist mode of “drawing in space,” welding sheets and rods of metal—often industrial discards—into an abstract open network of forms. This collage aesthetic, combined with the influence of Surrealism, led Smith, like his contemporaries in the world of painting, to formulate a new mode of expressionism amid the turbulent context of the World War II and its aftermath. Even at its most literal, Smith’s symbolism only hinted at the inner workings of his psyche, keeping full meaning veiled. In the 1950s, as he streamlined his aesthetic and his sculptures became more abstract, Smith continued to assert that his sculpture was a pure expression of his identity. He grew increasingly ambitious during the 1960s, creating works of monumental scale that were often painted in bright colors. When Smith died suddenly in a tragic car accident in 1965, he was at the height of his creative powers, and he left behind an expansive yet remarkably coherent, and extraordinarily powerful, body of work.